What's the expression, make lemonade out of lemons? Well I say make Rosemary Lemon Vodka out of lemons. My fine friends at Food Forward blessed me with a ton of lemons after our last canning class. They arrived at my house armed three huge cases of delicate and fragrant meyer lemons which we promptly transformed into 36 quarts of preserved lemons. I have been power canning all week trying to finish the case before the mold set in. I preserved them, curded them, marmaladed them and just when I thought I couldn't can another thing I realized I had a case of vodka in the garage. Lemon Vodka sounded just right and even better it didn't require firing up the stove. I recommend experimenting, try two kinds, or invent one to suit your own tastes and then have a tasting with lots of mixers so everyone can make their own cocktail. I would like to try a grapefruit rosemary combo. Please post your results in the comments section and let me know how it came out. Purists will probably shoot me, but I did not sterilize the jars. I washed them in HOT water and figured the vodka would kill anything in there. I used Ball 1/2 gallon jars. I highly recommend filtering through coffee filters; this is sure to remove any solids and give you a clearer product. You can easily substitute another lemon variety. Feel free to leave out the rosemary or perhaps try another herb. This recipe has two tablespoons of sugar. I find that this small amount doesn't quite sweeten the vodka, but it does somehow round out the flavor. You could omit the sugar or you could increase it if you like a sweeter product. With a paring knife or a vegetable peeler carefully,remove the peel from the lemons. Try to remove only the yellow zest, avoiding as much of the white pith as possible. Save the lemon for another use. 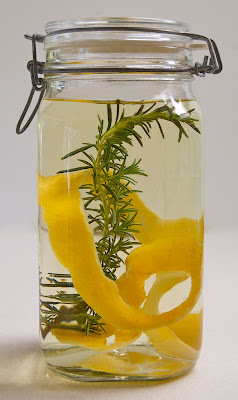 Put lemon peel, sugar and rosemary into clean ½ gallon jars (I used Ball). i need to lay off the wine and start drinking more hard spirits. Did you make limoncello? And don't you have a Meyer lemon tree already? Lemon-mania! Amazing! Does it really need refrigerating after you filter? Or is that just to keep the vodka cool (when I have room, I usually store mine in the freezer). As a food safety pro I can tell you botulism will not grow in vodka. Awesome! I love your boozy concoctions! We did limoncello, arancello, grapefruit vodka, cranberry-orange vodka and some bitters at the end of the year. I'm sort of obsessed with it now. In So-Cal right now we have an overabundance of citrus, it's daunting. This is not limoncello, which I find a bit too sweet. Let me know if you find a good recipe for it. oooh, I have to try this! I have 2 gallons of limoncello curing in the basement, and love lemon spirits. You wanna tell us about that case of vodka in your garage? Let's put it this way, I like to be prepared and it could be said that I have quantity issues. I forgive you for not sterilizing your jars, I agree that vodka kills most germs which is why I always follow a dozen raw oysters with a shot of vodka. Are you still only using potato vodka? Holy crap, this is awesome! Psyched to find your site... I am blessed at baking ...not at canning. I have 5 lbs of apricots sitting here, waiting for me to get busy! I will be using your site as the newbies guide to canning! Sweet Limes -aka- Limettas are currently available from Super H (Korean Grocery). I included them in several apple jams. But now I am thinking they would be much better with Vodka. You'd be pardoned for intuition this would prompt carelessness with respect to the blender. Unless, obviously, you're considering Johnnie Walker Master Blender, Jim Beveridge.